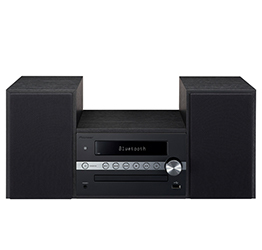 The X-CM56B CD stereo system’s simple set up, ease of use, and woodgrain finish makes it ideal for any room in your house. The X-CM56B speakers’ have an elegant black finish, which was designed to match a wide range of interiors, and their flexible design allows them to be placed either vertically or horizontally, making them an even easier fit into your lifestyle. 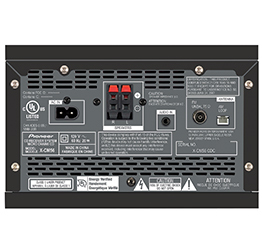 The X-CM56B stereo system offers user friendly features such as built in Bluetooth® to wirelessly enjoy music and internet radio from supported devices, such as smartphones, digital audio players, and personal computers. For smartphones or digital audio players that support the Bluetooth with NFC functionality, wireless setup couldn’t be easier - by simply holding the supported device near the X-CM56B, pairing is even quicker.